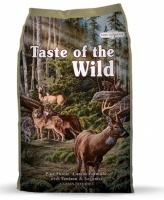 Taste of the Wild dog food has been growing in popularity for some time now and it's not hard to see why. 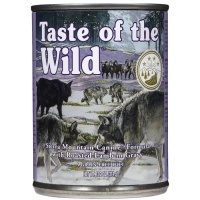 Made with roasted meats and supplemented with vegetables and fruits, the grain-free formulas provide a fantastic taste sensation, with highly digestible energy and antioxidants to support a healthy immune system. 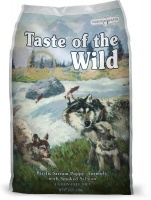 All Taste of the Wild dog foods are formulated to meet your dog's specific needs. They use a variety of ingredients to optimize the health benefits of each formula. 12 x 340g tins. Grain-free with smoked salmon. 12 x 340g tins. Grain-free with roasted lamb. 12 x 340g tins. 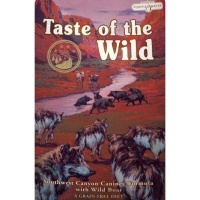 Grain-free with beef, lamb and wild boar. 12 x 340g tins. 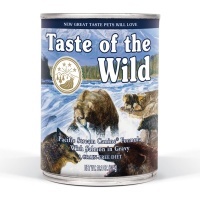 Grain-free with duck, chicken, quail and turkey.